In my previous article I gave some advice for people who want to get started in epoxy flooring. In this article I want to go a step further and provide advice to people who want to start their own epoxy flooring business. More importantly I want to discuss the costs involved I setting a flooring business. 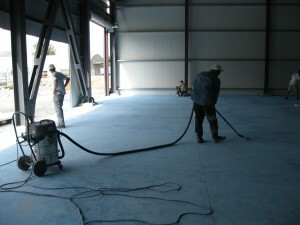 I am focusing primarily on the equipment required in getting involved in epoxy flooring. Apart from the equipment you should expect to have some overhead costs like maybe an office, storage space, a van for your tools and products. The biggest cost in setting up a resinous flooring business is the equipment required for surface preparation. As there is a large range of surface preparation equipment available, I always suggest start out with something flexible and versatile and you can always more advanced equipment if you land new projects that require specialized equipment. Start out with a smaller one-phase machine. Three phase machines are more productive as they have larger grinding diameters. But the problem with 3-phase grinders is that not all building sites have electrical power supplies for 3 phase machines. Invest in a 3-phase when you have a large enough project that justifies the cost. Along with your main floor grinding equipment you should own several handheld grinders. 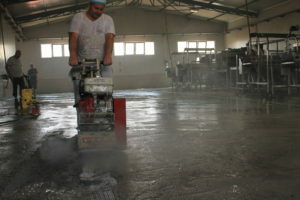 A handheld (bell shaped) concrete grinder is an amazing tool every flooring professional should own. Personally I recommend the Bosch GBR 14 CA. I am not an affiliate for Bosch but this tool has delivered some amazing work over the years. It is priced on the upper end (about 600 euros in Europe) but it was worth every penny. Furthermore you should invest in angle grinders. These are smaller and have less power than concrete grinders. They are useful for sanding, cutting screws and performing various other little tasks. Other important surface prep tools are shot blasters and scarifying equipment. These are very useful especially if you need to apply thicker coatings. But I would recommend that you invest in these when you have more work, or if the specific project on hand requires the use of such equipment. Keep in mind, in many countries there are subcontractors that can arrange to do shot-blasting if you do not want to invest in the equipment yourself. The other big equipment expense is dealing with all the dust that is generated from the surface preparation. 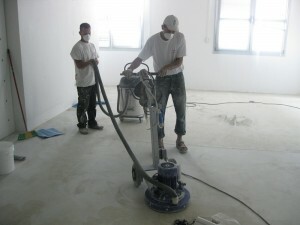 You need to have dust collection equipment as well as a vacuum cleaner. Some contractors opt to use the same for both tasks, but you will soon realize that it may be preferable to keep dust collection separately and use a standalone vacuum cleaner. Expect to need brooms –many brooms – and expect to replace them very frequently! For all of the above equipment you will require a range of extension cords as well as lighting equipment when working in dark areas. Trolleys are also useful in flooring projects. These can be used to move products around so workers don’t get tires. Also screeding trolleys are great tools if you need to apply many square metres a day of epoxy floor coating. I’ve left for last all those every day tools you need to actually apply the epoxy. Some of these tools will be disposable (such as paintbrushes, lambskin rollers, squeegees etc) and other tools are re-usable such as screed rakes and spiked rollers. You should have a range of trowels used for grouting and applying epoxy. All these handtools will require regular cleaning and replacing. Always have spare tools available on site. You don’t want something to break down when you are in the middle of a job. So there you have it. This is my starter’s list for an epoxy flooring contractor. This list is by no means exhaustive – In flooring it is common for more unexpected needs to come up. So what are your thoughts did I miss anything?